THE power of the internet is transforming the grocery trade, just as it has revolutionised so many other retail sectors. 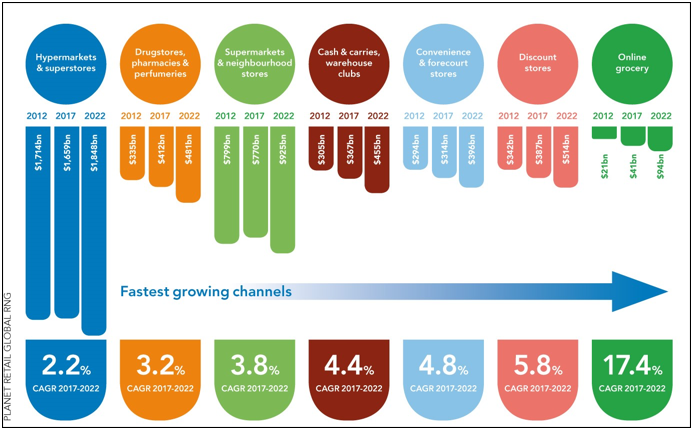 Our recent research has shown that the market share for online groceries is expected to grow at a CAGR of 17.4% worldwide from 2017 to 2022, influenced by global consumer trends such as the chase for experience and easy living. In Asia, this transformation is led by pioneers in the developed markets, such as South Korea; as well as the leap-froggers in developing markets, which include Shanghai, Bangkok and Jakarta. The average connected consumer spends an estimated 4.4 hours of his/her day online, of which more than half (56%) is spent on mobile. In last year’s Tetra Pak Index, we explored the ‘Connected Customer’, and how this rise of digital and online consumers is pushing brands in the region to pick up the pace of change and evolve their strategies to thrive, by initiating, joining and helping shape connected conversations. As retailers look to improve the overall online experience, they have to factor in how e-commerce is redefining the way consumers buy, experience and react to products — driving innovation and disruption throughout the value chain. However, this transformation is not just confined to online merchants. It is a catalyst for wider transformation where online and offline merchants work together to seamlessly provide an improved consumer experience, as well as increased efficiency across the entire supply chain. Consumers are increasingly expecting a seamless ‘omni-channel’ experience, and brands in the online grocery space have been presented the opportunity to take advantage of current trends and meet the needs of today’s ‘always on, on demand’ consumer generation. Today, e-commerce has redefined the way consumers receive, experience and react to products. Instead of a relatively linear process, e-commerce has created a circular model where constant innovation and disruption is required at every stage of the customer journey. With more ways to buy and more places to get information than ever before, brand to consumer engagement throughout the path-to-purchase, and afterwards, becomes essential. Consumers today use the web as a source of product discovery, which is often done via blogs and social media. Such independent reviews and comments risen in prominence, are now rated as the most influential marketing after a recommendation from family or friends. With many of these factors beyond the control of brands, this greater connectivity and the proliferation of online platforms present a challenge for brands, as consumers expect a consistent experience and messaging across all the touchpoints where they interact, especially on social media. Convenience is the number one driver of online grocery in all markets. Consumers are expecting a frictionless shopping experience across online and offline. However, consumers often find themselves facing many challenges while shopping online for groceries, such as the inability to inspect goods for their quality, as well as concerns over the reliability and timing of delivery . Given these challenges, along with the increase in the number of ways to buy and places of information, we’ve identified the five stages of today’s consumer experience. Discovery and search: Brands need to work harder than ever to capture attention and get their message across given the amount of information consumers are exposed to online. Arresting and, crucially, simple messaging is vital, particularly as mobile is increasingly the device of choice. Buy: Online shopping drastically reduces the visual real estate for products, especially on mobile. With many consumers wanting to inspect their goods, it’s important that brands ensure their products are instantly recognisable and consistent. This includes the copy, especially in categories such as baby food — where nutrition and ingredient information is paramount. 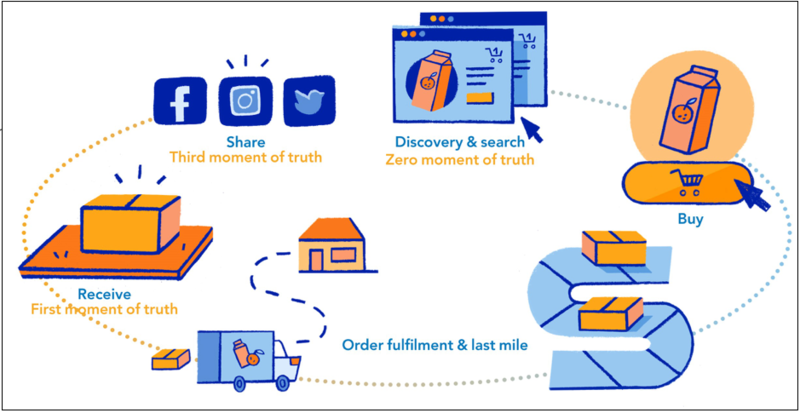 Order fulfilment and last mile delivery: Technology is transforming both supply chain and the consumer’s relationship, hence the winning logistics and supply chain is key to success in e-commerce. Constant innovation and investment in order fulfilment and the last mile, particularly in technology development such as highly automated central warehouses, data carrier systems such as RFID (Radio Frequency IDentification) and QR (Quick Response) codes, will help address consumer’s concerns on the quality and timing of delivery. Receive: Receiving and unpacking e-commerce goods are often seen as the first moment of truth, and packaging can make all the difference. A good packaging experience can have a positive impact and even create a memorable brand experience while the bad packaging that is hard to open, unattractive, or damaged can ruin the entire consumer experience towards brands. Share: Connected consumers are increasingly sharing opinions and experiences of food and beverage brands online. These ‘reviews’ not only contain a commentary on the product, but also include photos and commentary about packaging, making packaging, both good and bad, more visible than ever before. E-commerce is redefining the way consumers receive, experience and react to products —creating a new circular model with constant opportunities for brands to innovate and disrupt at every stage. 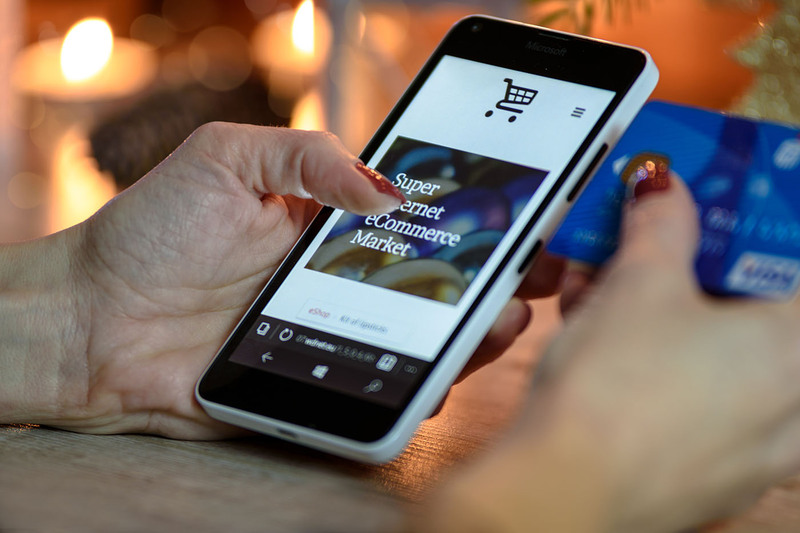 Consumers are loving the convenience of online shopping, and they are increasingly relied on packaging to make their purchase decisions, especially as they are unable to examine the product in person. The rise of online grocery is an opportunity for food and beverage brands, and packaging to play a key role in this. For example, smart packaging helps drive greater transparency and efficiency in the supply chain, while also enabling a direct, interactive relationship with the consumer. Looking forward, the most successful brands will study these opportunities and capitalise on them with the help of leading packaging and expertise providers, thereby increasing their profit margin and market share. Libby Costin is the vice president of Marketing and Product Management at Tetra Pak Asia.